In flowing electrodes internal solution of KCl slowly flows to the outside through the junction - small hole with porous membrane, or ceramic or - in older models - asbestous wick. While such electrode contaminates solution with KCl it does it very slowly and traces of K+ and Cl- ions released during measurements are in most cases just spectators. As the internal solution is lost from the flowing electrodes it must must be refilled so that its level is always above the level of the external (measured) solution. This way internal solution should never get contaminated. However, refilling of the combination electrodes adds to their maintenance cost and makes them difficult to use in portable pH meters. To overcome problems with filling internal solution is sometimes gelled. While this helps slow down leak, it doesn't prevent diffusional ion exchange through junction - thus internal solution gets contaminated by the ions diffusing from the external sources, at the same time loosing its own ions. 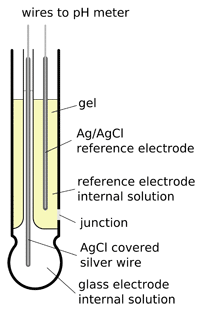 As the composition of internal solution changes and can't be restored by refilling, gel electrodes have in general shorter life time, although they are easier to use and maintain. 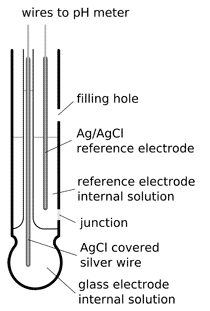 Other method of prolonging the lifetime of the electrode is use of double junction. Speed of the flow is one of important electrode parameters. It can't be too fast nor to slow. Flow can be too fast in case of broken membrane or lost (loose) wick, it can be too slow if the membrane/wick was clogged by some chemical precipitate - for example AgCl if the electrode was used to measure pH of solution containing Ag+ ions. See electrode cleaning to learn how to unclog electrode.